Djibouti have pulled out of the qualifying competition for the 2008 African Nations Cup that starts in September according to the Confederation of African Football (Caf). The Horn of Africa nation had been drawn to play Ivory Coast in their opening Group 1 match of the competition at home between 1 and 3 September. The other teams in the group are Gabon and Madagascar. 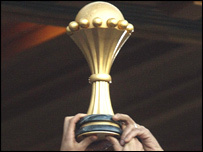 "We can confirm Djibouti has withdrawn from the competition," Caf spokesman Suleiman Habuba confirmed. "Ivory Coast will have to wait to play their next game." He added that he did not know why Djibouti had withdrawn and efforts to reach football officials in the former French colony had not been successful. Under Caf regulations Djibouti now face a fine of at least US$2000 as well as being suspended from the next African Cup of Nations qualifying campaign.